Thought you would be interested, no problem thank you for showing a lovely picture. Nice the way picked up on colour of pump to include in tubs..now if only my Guinness was served in pumps like that ..
that would be heaven BB lol. Very attractive red pump really compliments the red flowers! That is so attractive Eileen, love the colours. Great pic Irish. Hope you have a nice sized bucket for the Guiness. Great setting, The colour scheme works well with the Red Pump. What a lovely idea! Who does the up-keep, Eileen? Beautiful colouring Eileen .. Mmm 24th thats Thursday .. I like a guinness I don't need much excuse ... I have one in the cupboard that is at least 20 yrs. old , my Uncle always liked some when he came over from Australia , sadly he passed on and stopped coming , it's still in the cupboard waiting for him ! Have you read that here, when some villagers tried to make their village look as good, the 'Elf 'n' Safety' brigade stepped in - and stopped them!!!! Yes, it's true! Can you believe it? what a lovely jazzy snazzy corner enough to brighten anybody`s day. 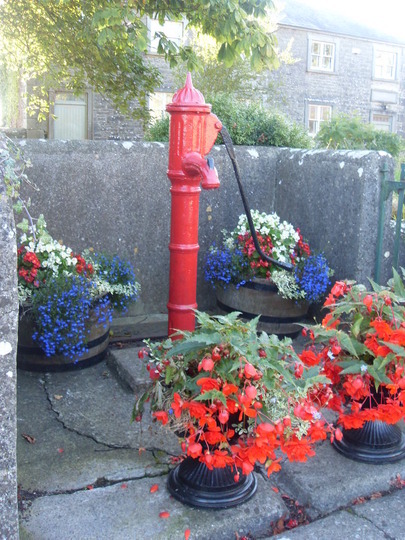 Very decorative - obviously the Village Pump? Nice 1! Now that's the kind of pump I want in my garden - pumping up Hard Irish - Whisky ;) !